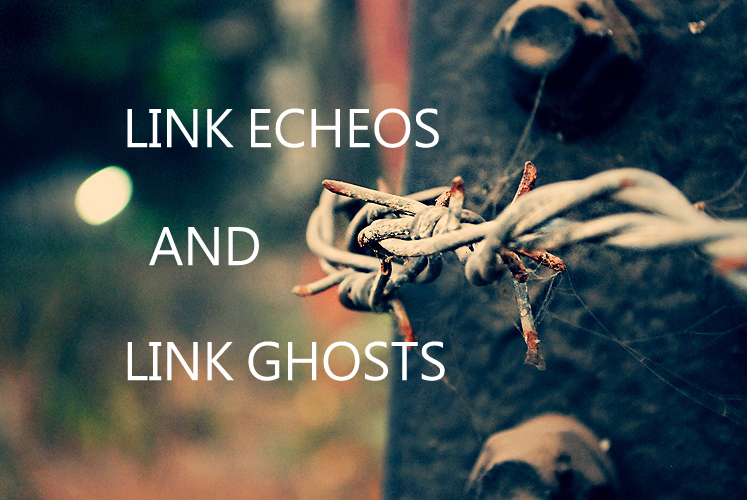 Link Echoes And Link Ghosts: How Do They Affect Your SEO? When it comes to your website, there’s a myriad of factors that can contribute to its success. A chance to get a viral post, consistent blogging and a good understanding of SEO all play their part. However, no matter how experienced you are, you may never have heard of link echoes and link ghosts. What are they, and what do they mean to your site and SEO? This guide has all the answers for you. There’s no denying that links back to other pages are a great way to drive traffic to your site. In the first instance, they show that you’re researching what you write, and offering readers more value as you can direct them to further reading. As well as this, those links are valuable to Google. Having links back to good, reputable websites improves your own ranking. The better you use links, the more likely you are to end up on the first page of Google SERPs. The internal links and the external links can both help you to get a good ranking. As you can see, there are many reasons why need to be paying attention to your links. And surely you should also avoid placing a large number of links in a single post or unvalued links. What are link echoes and link ghosts? Ok, so what are link echoes and link ghosts? A website was updated, removing the information from the original link. A website was taken down, either for updates or permanently, breaking the link. If the link was mentioned as part of a contest, the contest expiration might have caused the link to be removed. These are just a few reasons, but there are actually hundreds of reasons why that link no longer exists. The reason the term ‘link echoes‘ came about is that even though these links no longer exist, they’ll still have an impact on your site’s SEO and ranking. In a study conducted by Moz, it was found that if a link was removed from a Web page, the Web page itself didn’t drop very far in search engine rankings, if at all. It seems that as long as the link was once there, then the effect still lingers. How this affects your SERP? What does this mean for you and your site? It’s a good thing for your SERP or Search Engine Ranking Pages. Your ultimate goal is to creep up the rankings until you have the first link on there. Australian Help is expert in creating content that ranks well, and they’ll tell you that the higher you go, the more chance you have of getting clicked. Even if you’re the second link down, you could lose out on a lot of clicks. If these link echoes are still keeping you high up in the rankings, then this is good news for you. If you can gather enough high-quality links, then you’re looking at getting high rankings, even if they get removed later on. What does this all mean for your SEO, then? As a marketer or writer, you’re looking to promote your website anyway. That means getting expert writing from academized, Justarticlez, contentmart and other writing sites, using the right keywords, and creating useful content that Google will share with searchers. A big part of this is getting links from other sites to promote your own site. Promoters in the past have been keen on getting links that are kept live permanently, as they were seen to be more valuable. Now, though, it seems that it may actually be better just to ensure you get the links and not worry about how long they’ll last online, as they seem to have an effect whether they’re still active or not. Why link echoes retain their value? Website Value: Google is looking for good quality websites to link back to in their search results. If someone has clicked your link and not been sent back to the search results, then it’s clear you were able to give them what they were looking for. As this is the case, there’s no good reason to bump you down the listings if the link is removed. Other SERP factors: Google doesn’t exactly publish its algorithms, so we don’t know exactly what makes your site more valuable to them. Your link may have become a link echo, but that doesn’t mean that your site has lost value. There may be other factors at play here. Ranking factor: It’s possible that Google considers these links a signal, more than proof in their own right that your site is valuable. That means if the link was placed and used in the first place, then it will show that your site has value to readers. Just because the link is now gone, it doesn’t mean your site is now not as useful. But if you are linking to a website and that website is gone then you must remove the broken links of that website from your blog or website to get better ranking. This might not be the case with the link ghosts and link Echoes. So now that you know what link echoes and ghosts are, what does this mean for you? Basically, you don’t need to worry if a link is permanent or not, as long as you’re getting the links. If people are linking back to you, then that shows Google that you’re worth checking out. As you climb up the rankings this way, it’s important to keep your SEO tactics as white hat as you can. Google will clamp down on black hat tactics, so you need to be getting your links through legitimate means. As you become more popular, you will get more organic links and more organic traffic, so you’ll hopefully achieve a snowball effect with your publicity. All in all, you don’t need to worry too hard if your links are only temporary. If they are used properly, then they’ll still give you valuable traffic and ammunition to climb up those rankings. Are Binary Options A Good Way To Invest Your Money? HOW MUCH TIME DOES SEO TAKE TO START WORKING? These are some useful insight to take into consideration when working on your SEO. Will have try the plugin that you recommended for checking broken links in your other article. Thanks sharing Robin, good read. All credit goes to Brenda. She wrote this amazing article. I have a post coming up soon about link problems and thought this might help me. On the contrary, these all sound wonderful! Links no longer there, like ghosts, still helping to increase my SEO, cool! Ahrefs lets me know if links to my site broke. Great to hear they still could help me get search engine visibility. I am thankful to Brenda who wrote such a good post. And I am glad that you learned about the link ghosts and link Echoes. Hey Robin! So nice to meet Brenda here today! She really did a stand-up job for you sharing some great advice and tips on SEO! Something we all can use HUH? yes, we can all use it. I am guilty of updating my website, broken links is something I need to focus in on. Thank you for the great information. Very interesting post. As I have not heard of these terms but often wondered where links that were no longer being used went.. I do have a link checker plugin that helps me … very informative… Thank you! I am glad that you liked Brenda’s post. I’m glad that this article helped you with those terms. The worst thing for your blog is having broken links on it. I use the Broken Link Checker plugin to ensure all non-working links are removed. I know this is not quite the topic of discussion here, but it should be mentioned! That’s a Good idea. I will try to insert few lines about the broken links.